Looks like a nice ride; with a great way to haul extra gas. I have 2 tuff jugs.
. . . "a great way to haul extra gas. I have 2 tuff jugs." . . .
No way I would "tanker fuel" that way. An off field landing and you may turn into a crispy criiter. To each his own. Besides that, it would exceed the baggage compartment structural weight limit for that airplane. With 135hp, no way that version is LSA legal unless they hang a drag chute off the back at all times! But then it climbs like a banshee! It takes a lot of horsepower to make much increase in speed. 35% is a lot to me. What's a lot to you? 35% does seem to be a big increase in power, but the increase in speed will be a considerably smaller increase. I look back at the standard equation that says it takes a 4 times the power to double the speed. The increase in speed will only be realized if you increase the prop pitch, or turn it at a faster RPM. "the unbelievable fast version of BRISTELL"
Andy, I am familiar with aircraft that have had an increase in power of near 35%, and the speed increase was very small. As an airplane nears Vh the drag profile is going up rapidly, so any increase in speed requires a bunch of extra power. Now assuming the 915is has the same RPM limitations as the 912 the RPM for Vh will be 5500. I do not know the set up on the Bristell, but if it is like our airplanes we set the throttle for 5600 to 5650 full throttle level flight. If they are the same all they have to do is keep the prop pitch the same with the 5500 max continuous limit and the Vh stays the same. They would then likely have a higher RPM full throttle level flight. Whoa... that's crazy fast! 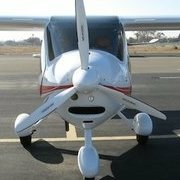 Over double LSA speed? Hard to say anything from that video. It's in kph, and at 12,500ft. The speed shown is kilometers per hour. 225 kph = about 121 knots. Oops..... as Emily Litella might say. 121 knots indicated at 12500' and -6 deg yields a 148 knots true airspeed. Pretty good. At face value, I'd say those numbers are quite good. 6 gal/hr. at 141 kts? Not to mention the aesthetics. That withstanding, I think our CTSW's get better fuel economy, sans, getting there sooner. The top speed takes it out of Light Sport. It might not take much to get it there if the stall speeds are low enough. The airplane in Dan Johnson's article appears to be a new model from Bristell. It is shown as a 130 TI in their media page. Who knows what other changes have been made to the airplane. LOL, that airplane cruises at the CTSW Vne (145kt). I think it will take both prop pitch and max continuous RPM limitations to get it to LSA specs. It can be done of course. I'd love to see the climb rate on that thing pitched flat at max RPM! Or a change in aerodynamics. It could be done by placard if it is only top speed. A bigger issue would be the stall speeds. Sure, they could add a bunch of drag, steps, etc. to slow it down. I don't think the FAA will accept "Here's a 175mph airplane, but this placard says not to go past 138mph, so totally kosher, right?" The Bristell with the 912iS is LSA legal on stall speeds, I bet that won't be too hard an issue for this one. Carbon Cub does it with 185 hp engine for takeoff only - "5 min. max".